The SureCall EZ Call has been discontinued and replaced by the new and improved SureCall EZ 4G kit. The SureCall EZ Call is designed to be one of the easiest and economical voice and 3G cellular signal boosters on the market. 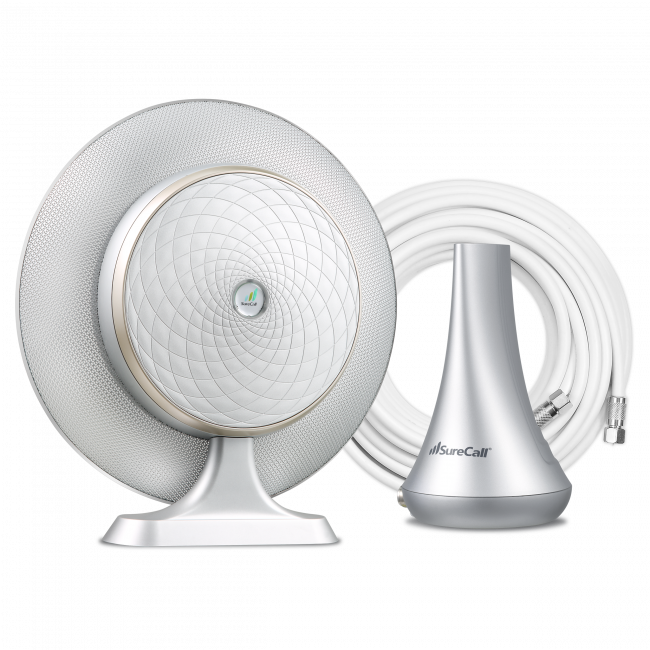 Simply place the window unit of the booster in the window of your home or office that gets the best signal, and then run the included cable to the inside coverage unit, where you'll place in the area where you need better voice calls and 3G data. Plug in the window unit and the booster will start working immediately. Please Note: For maximum performance, you should have 30+ ft of separation between the window unit and the inside antenna. No outside antenna required. The window unit acts as an antenna and booster in one. Easy setup and installation. Get up and running with your new booster in just a few minutes. Boost the 2G and 3G networks on all carriers, for better voice calls and 3G data speeds. An attractive design that looks great in your home or office. The existing signal strength in the window of your home or office where you plan to place the window unit directly impacts how much coverage you get from the SureCall EZ Call. In addition, there are many factors that go into determining total coverage area, so actual results may vary from these estimates. If you need more coverage than what one SureCall EZ Call can provide, it is possible to use multiple kits within the same building. Please contact us for assistance with mapping out the ideal booster locations. The SureCall EZ Call supports the 2G and 3G networks from virtually all carriers in North America. For other locations, please consult the frequencies outlined below to see if this product will work for you. First, decide if you're going to use the double sided tape to stick the window unit directly to the window or if you're going to use the included stand (in which case, you'll need to attach the stand to the window unit). Once you've decided, then locate the window unit in the window where you get the best initial cell signal. Next, connect the included 50 ft RG-6 cable to the cable connector that is connected to the window unit, and then run to the location where you plan to locate the inside desktop antenna. 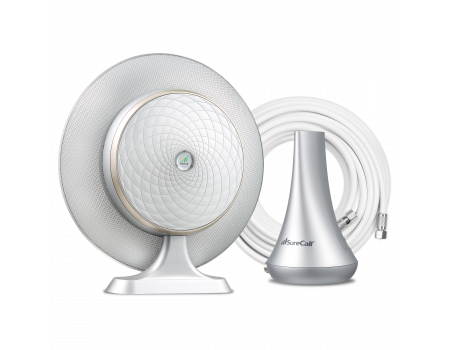 Connect the desktop antenna and locate it on a desk or table for best coverage. Connect the AC adapter to the other connector coming off the window unit, and plug into a standard wall outlet. 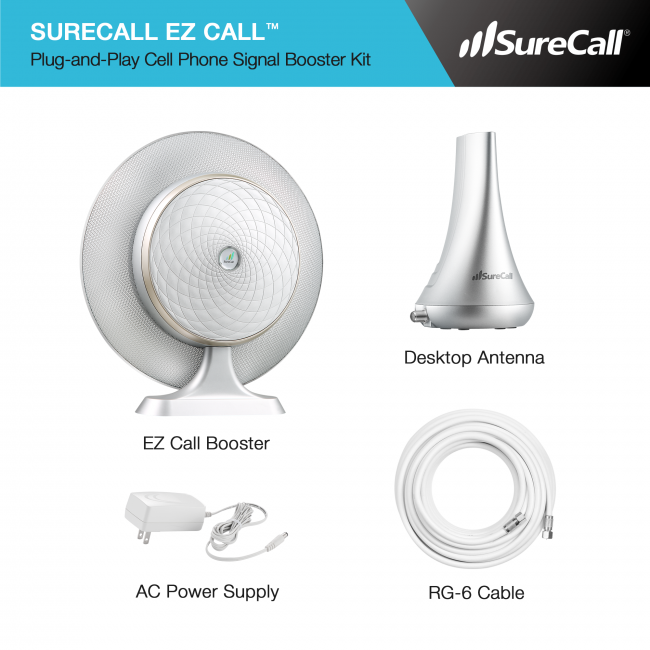 The SureCall EZ Call will automatically adjust to the current setup and create the best possible coverage area inside of the home or office for you. Please note: For maximum coverage, you should have 30+ feet of separation between the window unit and desktop antenna.